No sweating allowed in the Ice Hotel. Sweat makes ice inside your Nordic sleeping bag. Curious concern in a room holding steady at 23 degrees but I felt my body heat rising and anxiety was the cause. My zipper got stuck. Sleeping bag zipper that is, and I was traveling solo, no buddy to help me. Borrowed boots, coat, ski pants and sweater dutifully piled on the ice chair and me in only my silk long johns as instructed. Deep breathing got me calm, and zipped properly. That matters in this Quebec hotel of ice and snow. 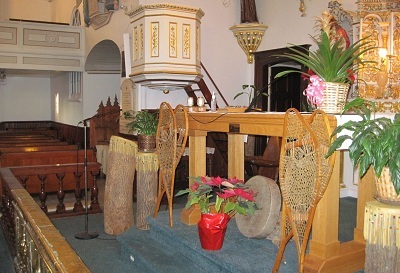 Church in Wendake, Quebec, the Huron-Wendat First Nations community with hotel, museum, restaurants and permanent residents. Art for 2012 reflects the First Nations—Inuits, Cris, Innus and Huron-Wendat peoples original to this region. It melts come summer. New theme next year. Hotel de Glace, as French-speaking neighbors call this 36-room inn, is a work of art: sculpted and carved four-foot walls of snow and chairs, headboards and tables of thick ice. Fur pellets cushion many of the sculpted ice chairs and sofas in the Hotel de Glace. Possible to just take a tour but Traveling Moms are immersion prone and that means bedding down. I expected to feel a bit lonely, wishing for a partner to laugh and wonder with, but I was astonished to see full families. The rooms and suites have one, two and three queen ice beds. Sure hope none of the kids need a bathroom call, because that means boots and pants back on and a walk across the yard to the building with lights and water. 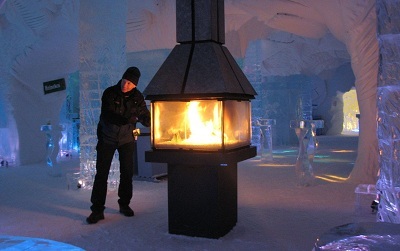 The bar in the Quebec City Ice hotel has a fireplace for hand warming; drink glasses are made of ice. The yard is meant for play before bed; heat your body in the sauna and hot tubs. This year I hear an ice skating rink has been added. I stayed in 2011. I launch all my travels from my home base in South Georgia, hence the need to borrow ice worthy clothes. If I can enjoy a night on ice, you can too. Top Photo: Journalist Christine Tibbetts on the frozen St. Lawrence River. Photo by Traveling Mom founder, guru, entrepreneur and social media expert Kim Orlando. 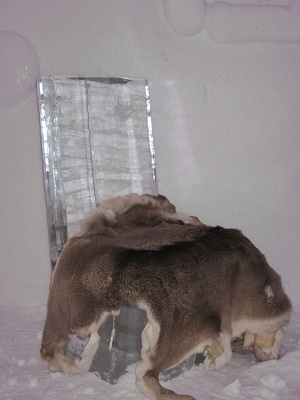 I stayed there and survived last winter—what an experience at that Ice Hotel! Brr! Sounds like a once (and only once!) in a lifetime experience for me. Do they get many return guests? I am not a winter person,but I dig that ice chair….very cool! 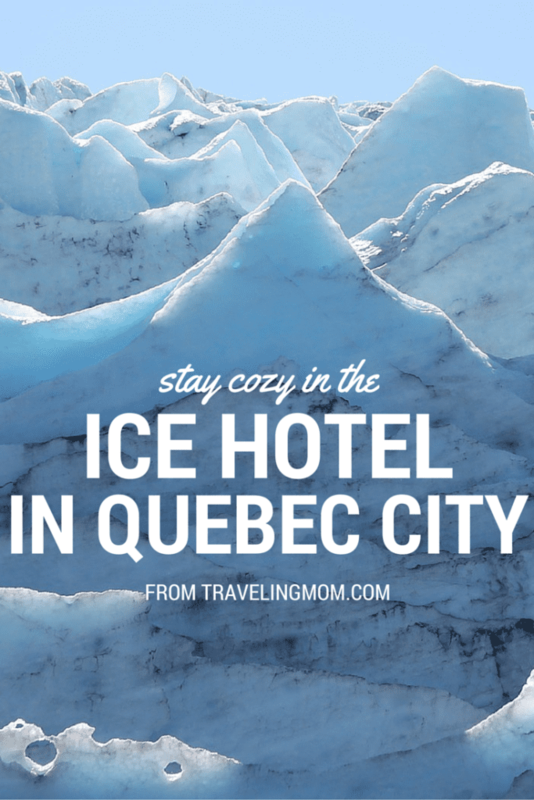 Southeast Michigan Mom — I was astonished to learn from Ice Hotel staff they do indeed have return guests. Some kind of anniversary, eh, but people do it. Homeschooling Traveling Mom — did you take the kids? I don’t think I’d ever do this but reading about it looks fun!